Paul discussing the info he found out about Andrew with Susan and Sam and how he'll bury the truth part of it. Rebecca telling Sam and Elle the deal she did with Paul to stop the story about Andrew appearing in the paper. Susan being taken to hospital giving Libby strict instructions not to call Karl. Toadie finalising Rachel's contract with the record company for her. The police telling Zeke's family that somebody has been using his bank account and wondering if there is any reason for Zeke not wanting to be found. Susan, Rachel and Ringo watch on as Karl ransacks Zeke's room looking for evidence that he has ran away to help prove his theory that Zeke is alive. In a drawer, he comes across a tin containing over $1000. Ringo reveals that Zeke was doing other peoples homework for money but thought that was just a couple of times. Back in the livingroom, Susan suggests Taylah name when anything Karl wonders if he had an accomplice. SUSAN: You're telling me we don't know our son at all? Declan is having trouble trying to accept ‘Zeke's plan' even when Rachel reminds him that he thought Zeke had been acting weird lately. DECLAN: Yes but this is crazy, Zeke's not Jason Bourne. Didge agrees with Declan too – there is no way that Zeke could have planned it, so Rachel asks who's been using Zeke's bank account? “I don't know his PIN. Nobody knows his PIN” she says before spotting Zeke's computer and remembers that she knows the password to get into it. Once she logs in, up pops Zeke's video diary and the teens gather round to watch it. ZEKE: Hi there, Zeke. Um, it's me. Um, just trying to get some stuff off my chest that's all, so uh, here we go. Now what did I want to talk about... oh yeah, that's right Declan. You know, I mean it's cool that you ran off on your pregnant girlfriend, it's cool that you keep harassing me, but you know what mate? You're pathetic. DIDGE: (rubbing Declan's arm sympathetically) That was really harsh. RACHEL: (under her breath) Go Zeke. ZEKE: Yeah, um, Ringo's okay I guess. I mean it's not like I can go into my own room. It's not like I can relax. All he talks about is football and Donna. (Ringo looks peeved and stands up.) I don't care about how hard you can tackle a football, mate. I don't care about how fast you can run the track. DIDGE: He sounds so mean. RACHEL: This isn't like him at all. ZEKE: When I talk to him, all I can see his little head doing is football/Donna. Rachel suggests that they should just turn it off but despite Didge agreeing, nobody moves to turn it off. Zeke then reveals that Donna tried to get herself pregnant when she threw her pill into the bin, which of course is news to Ringo who isn't amused. The girls tell him that it wasn't their place to say something to him. RINGO: So she can just do what she wants and you don't care? DIDGE: She made a mistake. RINGO: No, I made a mistake. ZEKE: I'm kind of wondering why I'm talking to myself. It's a bit weird I guess. But like I said before I just… I just need to get stuff off my chest. Paul finds a reception committee waiting for him as he steps out of his car and tries to get his excuses out first. Rebecca isn't taking any prisoners though and starts to whack Paul with a copy of his newspaper because he ran a different story about Andrew. Paul threatens to report Rebecca to the police for assaulting him. REBECCA: Oh really and tell them what – someone's beating you up with your own newspaper? Elle isn't happy either at her hard work not being printed and Rebecca follows up her outburst by telling Paul that she is so looking forward to the day when she no longer has to look at his face and his “I think you'll miss me” reply earns him another whack of the paper! ELLE: You get everything you deserve. Paul is in a foul mood as he enters the house and tells Simon to “go play in the traffic” when he moans that there aren't any decent games on Paul's laptop. Simon decides its time to leave (and takes Tegan with him too) when he can see that Ringo (who followed Paul in) wants to talk with Donna. Donna asks if there is any more news about Zeke as she tidies the mess her siblings have made, jokingly asking him to remind her never to have kids! RINGO: I think you'd make a great mum… caring, responsible. DONNA: (shyly) I guess so. He tells her about the video diary Zeke made… and that she tried to trap him into having a baby. Donna doesn't say anything so he about turns to head out the door but she asks him to wait. RINGO: Is it true or not? RINGO: So now you're lying as well. “This is great” he adds before finally leaving the house, passing Tegan as she returns for something. “What's up with him?” she asks her sister. 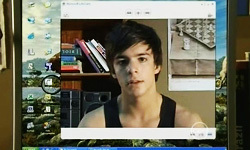 Rachel is showing Susan Zeke's video diary and his thoughts on her and Angus. He isn't exactly complementary about either of them and the fact that Rachel is back living with them almost as if nothing ever happened. ZEKE: How am I meant to respect her ever again? I can't. I won't ever. Once it's finished, Susan tries to tell her that Zeke was angry when he made it but Rachel remarks that she thought she knew how her brother was feeling but adds that it looks like she didn't know him at all. SUSAN: (hugging Rachel) I'm so sorry. RACHEL: It's not your fault. SUSAN: No, it's not your fault either. RACHEL: That's not what he thought. …And straight over to #32 having changed from wearing trousers and a top into a tight fitting, revealing low cut dress. Ty wonders why she is dressed as she is and Rachel explains that it's what the record company want her to wear. He tries to tell her to concentrate on the news that Zeke might be alive but Rachel looks miffed that he doesn't seem to “want her” however Declan gives her the complements that she'd probably hoped go get from Ty when he arrives with Didge. She however takes the opposite slant – it's a bit too revealing, but that suits Rachel fine as that is the image she is after for selling records and seems very much in denial about what is going on at home when Didge mentions that Susan is worried about her. DIDGE: (after Rachel walks away) She's losing it. 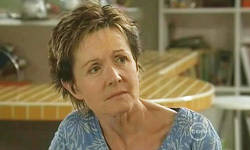 Tegan decides to play confidant to Donna (at #22) and Ringo (at TGS) over their relationship troubles but twists everything that one says to suit the other person - “No-one calls my sister a liar” she tells Donna but twists it round to say “she's a liar, always has been” when Ringo asks why would she lie and that she tells both of them that they “deserve so much better better”. Who needs enemies when you've got a sister like that! Simon walks into TGS as Ringo leaves and wonders why she's been talking to him and with and angelic look on her face; she replies that he was “kind of mixed up but I think I helped straighten a few things out”. Declan and Didge try to console Ringo as they play pool while at the bar, Rachel shows off to Ty more clothes (a jacket this time) and suggestively says he can take it off later. Karl interrupts her chat to ask for some pictures of Zeke to help find him, which she agrees to, but before she does she spots Ringo and asks where Donna is. “Who” is his reply and Didge cuts her off to suggest that they pay her a visit and doesn't take too kindly to Didge asking how she is. Paul walks into the bar and Elle has a go at him for deliberately trying to ruin Rebecca's love life. ELLE: You know I wish someone would do a story on you. PAUL: Yes, yes, that would be great. Who's going to print it though eh?! Tegan tells Simon that they've got to give Donna their love and understanding as they make their way across the complex before we cut to Elle coming out of Toadie's office. It looks like Elle put her thinking cap on after that remark from Paul because she's mocked up a replica front page of the Erinsborough News and hands an excited Toadie one as a thank you for using his photocopier before leaving him. 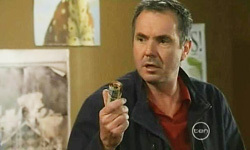 Karl takes her place and asks Toadie to use his photocopier, which he makes a flippant remark about before realising what Karl wants to use it for – to make posters asking for information about Zeke. When Toadie questions if he should have used a more recent photo, Karl remarks about Zeke avoiding the Christmas photo's and wonders if Zeke had planned his disappearance months in advance. KARL: (after seeing a look from Toadie) Toadie he's alive, I'm sure of it, I can feel it. TOADIE: So what do the police say? KARL: It doesn't matter what they say, I'm finding him. Toadie volunteers to sort out the posters to allow Karl to go home and be with Susan but in the distance, Karl spots someone that looks like Zeke starts running, thinking that it is Zeke. Break over and it wasn't Zeke that Karl spotted. Toadie questions why he thinks Zeke would be hanging around locally? Karl doesn't answer and Toadie sends him off home to be with Susan after promising to bring round the altered posters. As he leaves, we cut to Rebecca (and Elle) handing out Elle's work – Erinsborough News flyers with a picture of Paul from episode 1 (where he was dressed up as a baby complete with nappy and bib for Des Clarke's stagger – check out the summary archive for pictures) with ‘Robinson Revealed' as the headline. REBECCA: (as Paul walks away) Robinson Revealed. See your local newspaper editor like you have never seen him before. The girls (and Simon) are laughing at the flyer as a very annoyed Paul arrives home and heads straight upstairs. Donna asks her brother to leave so she can seek advice from Didge and Rachel on how to fix things with Ringo. Rachel suggests a revealing outfit because that is all boys really care about. Didge tries to reassure her friend that she just made a mistake when Donna mentioned what Tegan said - that she was too good for him but she thinks it's the other way around. Rachel agrees that she made a regrettable mistake but “Ringo just needs to chill out” and instructs her to go make herself pretty dress herself up and throw herself at Ringo. Donna leaves and Didge isn't impressed at the advice Rachel has just given because she thinks all that is required is a proper conversation. “Less talk more action” is Rachel's definite advice! DIDGE: Have you had a lobotomy?! RACHEL: Stop giving me a hard time. DIDGE: Well I will if you stop being such a fake. RACHEL: Ah, so you agree with Zeke then do you? DIDGE: (stunned) Listen I know you're trying to pretend this stuff with Zeke isn't happening. RACHEL: (angry) No Zeke can take a run and jump for all I care and I just think that you are jealous. DIDGE: (puzzled) Jealous of what? RACHEL: The fact that Donna and I can still look good and you can't because you got pregnant. Didge calls to see if Ty can talk any sense into Rachel but he thinks having a distraction, like the music, is a good thing because it makes her happy. Susan ends her call with Taylah who confirms that she doesn't know anything about Zeke's disappearance. 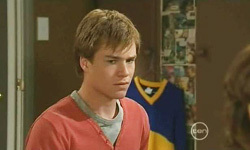 Karl is still adamant that it was Zeke he saw and heads out to put up the newly done posters that Toadie has come round to drop off, ignoring Susan's advice of getting some rest because “if he's in the area I need to get these up now”. Susan asks Toadie if he saw Zeke but he replies that all he saw was the back of someone's head… anyone's head. “That's what the police said too,” Susan adds. SUSAN: What's happening to us? TOADIE: Hey, you guys will be alright. You're strong; you're like the Superman of families. Rachel debates whether to answer her phone or not (Didge is calling) because she doesn't fancy another lecture. Elle says bye to them adding that Ty should be in for a quiet night. Karl arrives to put up a wanted poster of Zeke (Rebecca had given him permission to do so) and Rachel rushes up to tell Ty that they should go do something. He agrees but once he finishes working and knocks back Rachel's suggestion of going to get her laptop so they can write some songs. “Why not now?” she asks and he turns round to look at the wanted poster Karl has just pinned up saying “that there is too much going on right now.” She tries to reassure him that she is fine, which he doesn't believe. Karl says bye to her as he leaves to put more posters up and she heads over to the door and bolts it (all the other customers had previously left before Karl). TY: What are you doing? RACHEL: Taking advantage of an empty bar. She then heads round behind the bar and makes it clear when she kisses him that she doesn't want to talk about Zeke or anything else! RACHEL: (before kissing him) If you really want to help me don't talk about Zeke.